Heat the oven to 350 degrees F and line a baking sheet with foil. Rub the inside of a 3-quart enameled cast-iron casserole dish with the garlic, pressing hard so it releases its juices. When the garlic juice dries, generously butter the casserole dish. Layer the potatoes in the dish, seasoning them with salt and white pepper as you go. After half of the potatoes have been used, sprinkle them with half of the cheese. Combine the cream and milk in a large measuring cup or a bowl and add the nutmeg. Pour the cream and milk over the potatoes. Place the dish on top of the stove over medium-high heat, but watch it carefully. When the cream starts to simmer, about 4 minutes, turn off the heat and sprinkle the remaining cheese on top. 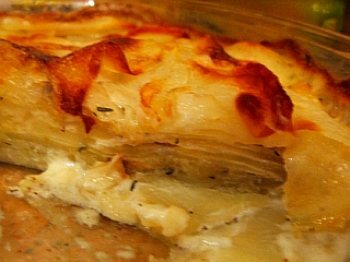 Place the casserole dish on the foil-lined baking sheet and bake the gratin until the potatoes are tender when a knife is inserted, about 1 hour. The top will be brown and bubbly. Let the gratin sit for 10 to 15 minutes before serving.